In recent years, increased research efforts have been directed to improving the communication of forensic scientific expert evidence. Typically, approaches have aimed to find a balance between maintaining the scientific accuracy of the communication and its comprehensibility for non-scientists. While it is necessary to modify the language of expert evidence, modifying language on its own is not enough to address the potential for miscommunication and misunderstanding. The communicative context must be considered more broadly. For example, in pre-trial contexts, communication is often constrained by being written, asynchronous, and formal. 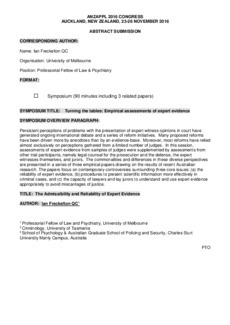 This paper draws on Australian empirical research of expert reports and interviews with lawyers, judges, police investigators, and forensic scientists. Practical examples are provided to highlight the benefits of inter-professional dialogue to shared understanding of expert evidence. The presentation concludes with a discussion of whether and how existing communication barriers may be reduced to facilitate understanding of expert evidence and ensure its effective contribution to the administration of justice.